Nothing has brought pedagogical theory into greater disrepute than the belief that it is identified with handing out to teachers recipes and models to be followed in teaching . I've written about this before, but the concept of engaging students in conversations and engaging, as an educator, in conversational assessment, is something that I continue to investigate. Of course, it is not easy to have meaningful and authentic conversations with students about a literary text that they're reading. First of all, they know very well that I'm an expert - even if I don't see myself as one. Therefore, they are absolutely convinced that they cannot contribute anything to the discussion that I don't already know. No matter how much I try to show them that there are still many aspects of a given topic that I am not very familiar with, students persist in their belief that teachers are experts. So, I often try to start conversations and create activities that are just as challenging for me as they are for them. This calls for quite a bit of creativity and forces me to abandon tried and tested lesson plans. Last month, I decided to help my students engage with Anne Frank's The Diary of a Young Girl as more than just a literary text. I wanted them to look at it as an experience, as life written down by someone their own age. They find it difficult not to treat the diary as just another "big book" that they study at school. I wanted them to think about Anne as a person and her diary as a personal record. I wanted them to have an opportunity to engage with the text and think about what Anne's words and experiences meant to them. I wanted to create an avenue for a personal connection - not an easy task in a classroom setting where every text we study is likely to be perceived as a literary text first and a personal experience second. At the same time, I also wanted to engage myself as a participant. I wanted to model the kind of personal engagement I wanted my students to experience. I always listen to music when I read. Last night I was listening to Mozart and re-reading parts of the diary for our discussion today. Suddenly, I realized that the piece I was listening to suited the passage I was reading perfectly. It felt almost like the best soundtrack for that specific passage. So, I decided to make a list of songs and classical pieces that, in my opinion, would work well as a soundtrack for Anne's diary. I want you to know that this took a long time and I found it very difficult to choose the songs. I kept searching the mixwit database for all kinds of songs that I thought would be perfect, but then I realized that the lyrics didn't really work or that the song was actually very different from how I remembered it. In other words, I had to spend quite a bit of time not just coming up with possible song titles for this but also justifying my choices. So, I would like you to do the same. Create a mixwit account and then search the database for tracks that, in your opinion, would be perfect for a soundtrack for The Diary of a Young Girl . There's one catch, though: You have to be able to justify your decisions. And then the conversations started. The one thing that made a huge impact was that I had challenged them to create something that I myself had already done. They could interact with my playlist and learn from the process I had engaged in prior to starting their own. They could critique my work and analyze it before embarking on their own journey of creating a soundtrack. In other words, I had entered the classroom and started the conversation as a participant. Creating my own mixwit tape placed me in the position of a learner. I eagerly shared with them my experiences of using mixwit and choosing the appropriate songs. The point here is that what they were encouraged to do was not based on an abstract assignment description. I had entered the classroom with evidence of my own meaningful personal engagement with the diary, not just a typed handout explaining what they had to do. This exercise led to a number of meaningful conversations with my students about Anne Frank, her writing, and our interpretations of her personality and her work. The fact that they all needed to justify their musical choices ensured that the conversations we had focused not just on the music but also, perhaps primarily, on the text. I had many one-on-one conversations with my students in which they talked about specific aspects of Anne's personality and shared their knowledge of popular music with me. They read and listened to the lyrics carefully because they realized that the choices had to be justified and couldn't be in any way offensive to the sanctity of the text written by a girl their age who perished in the Holocaust. This wasn't just about listening to music, it was about making connections, and they all realized that, in order to make them, they had to become very familiar with both the songs and the text - I had encouraged them to become experts. I was also pleased that this activity gave all of us an opportunity to engage with the diary in a new and unique way. The students still studied the text, they still had to think about Anne as a person and a writer, but they had to do it in a context that rarely enters our classrooms, one that certainly is never present when we discuss literary texts. I learned that entering the community as a participant allowed me to have conversations with my students that they did not perceive as instructional. Yes, they were talking to Mr.Glogowski about their songs and their reasons for picking them, but it did not feel like school talk. 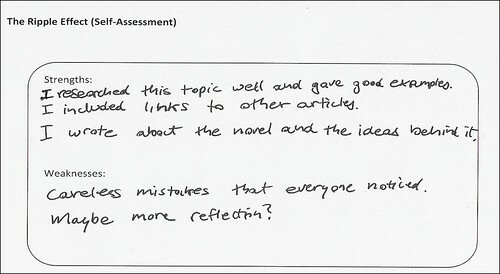 ... and, of course, the best thing about this was that there was no rubric or evaluation sheet. Why? Because when you listen to student soundtracks for The Diary of a Young Girl and the music works, the music fits, you just know the students did a great job ... and they do too - not because they received a rubric with a high mark, but because their work emerged from meaningful conversations with each other and the teacher. My first entry on this blog, posted on February 22, 2005, marked the beginning of my doctoral research on blogging communities. I was interested in what happens when a group of grade eight students is given a place where they can engage as writers and move away from the "schooliness" of traditional class work. When I started, I really did not know what to expect. I had high hopes, but no preconceived notions or expectations. And now, three years later, the research is done, and I am very happy to report that I have successfully defended my PhD thesis. It was a fascinating journey. I learned a lot about writing in online environments, about student interactions online, and about fostering student engagement in online spaces. However, one of the most personally relevant findings of my research was the impact that it had on me - the teacher-researcher. Before I explain why I chose this painting, let me first elaborate on Caravaggio as he himself is an important figure to consider, an important role model for 21st century teachers. Caravaggio's work was revolutionary. He was an innovator in his time who rejected established conventions. Instead of painting epic scenes with masses of people and religious symbolism (as was the established norm), he chose to focus on the personal struggles and experiences of his subjects. He chose to highlight the individual. The subjects he chose were mere mortals, representatives of the working class - the poor, humble, ordinary people of his time. The faith he depicted in his work was the faith of the simple, uneducated masses, not the faith of the grand Biblical narratives. Caravaggio focused on what he saw around him. His paintings feature wrinkled, aged faces, torn clothing, and unadorned, simple, often neglected interiors. Truth, in other words, truth as he saw it around him on a daily basis, was more important to him than conventions. So, what does all of this have to do with teaching in the 21st century? That painting by Caravaggio has became for me a metaphor that I like to use to explain the role of the teacher in a blogging community. Since I'm using it as a metaphor, I am interested only in its visual appeal - the placing of the subjects, the light that penetrates the scene, and the fact that the man carrying the lantern on the right side of the painting, the one who looks with interest over the heads of the two Roman soldiers, has been identified as Caravaggio's self-portrait. (Caravaggio is well-known for inserting his self-portrait, inserting himself, so to speak, into his paintings.). I believe that, much like Caravaggio in this painting, a teacher in a blogging community should enter the context that gives rise to his or her work. Caravaggio portrays himself as one of the characters. He becomes implicated in his painting. He is both subject and artist ... and that is why I think this painting is so relevant to my research and can help convey the redefined character of teacher presence in online communities. It makes visible some key implications of my study in the field of teacher professional development. What this painting says to me is that we can gain a better understanding of our classrooms-as-communities if we immerse ourselves in them. In the manner of Caravaggio, teachers should weave their readerly, personal voices into the fabric of classrooms-as-communities. What my experiences illustrate, and what the painting metaphorically emphasizes, is that teacher professional development in the 21st century requires that we look closely at how to most effectively embed ourselves in our practice and in the experiences and interactions of our students. Professional development in the networked world requires that we look closely not only at what we do as educators but also at how we are embedded in educational contexts. Much like Caravaggio, we have to narrate ourselves into existence through participation in our classrooms in a way that is non-authoritarian, readerly, and conversational. 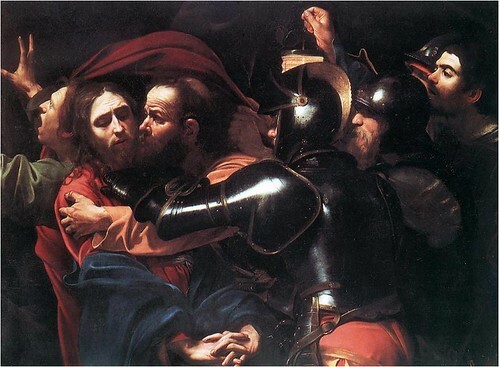 Much like Caravaggio in this painting, we need to be present in our classrooms as providers of light. Our guidance is needed and important. But, too often, our guidance becomes authoritarian and fails to take into account the voices of our students. We don't often peer questioningly over the shoulders of our students. Instead, we impose the content and pre-define the learning trajectories for our students. Why don't we take the time to just listen and observe once in a while? Those of us who give our students the freedom to define themselves through their work in classroom communities know how much we can learn by listening and observing. We should not be afraid to step down from behind the lectern and move to the edge of the community, where we can redefine our presence as that of a participant, as one of the voices, not as the voice that dominates, demands, and evaluates. What Caravaggio's painting reminds me of is that I can be just as helpful as a facilitator if I engage from the sidelines and do not dominate the community as its focal point. Let student voices remain in the centre, let them be the focal point of the community where they interact, engage, and learn. This reconfigured approach requires a difficult shift in our understanding of classroom practice. It requires that we accept a new dethroned position and become embedded practitioners - embedded in the classroom interactions as readers and participants, not evaluators and overseers. That brings me to another important point: What's Next? How do we prepare teachers to teach 21st century learners whose lives are based on rich interactions in multiple online environments? How do we help new teachers move away from what Marshall McLuhan once called the "imposing of stencils" and adopt a practice of probing and exploration? How do we help new teachers acquire the courage to transform their classrooms into communities of learners and transform themselves into participants who can embed themselves in those communities? movement toward the revelation of something that is hidden, as a question verbalized or not, as search for clarity, as a moment of attention, suggestion, and vigilance ... there could be no creativity without the curiosity that moves us and sets us patiently impatient before a world that we did not make, to add to it something of our own making (Freire, 1998, pp.37-38). [...] there is no such thing as teaching without research and research without teaching. One inhabits the body of the other. As I teach, I continue to search and re-search. I teach because I search, because I question, and because I submit myself to questioning. I research because I notice things, take cognizance of them. And in so doing, I intervene. And intervening, I educate and educate myself. I do research so as to know what I do not yet know and to communicate and proclaim what I discover (Freire, 1998, pp.35). Recently, Al Upton, an award-winning teacher from Adelaide, Australia whose work I've admired for a very long time, was forced to close his classroom community that has proven over the years to be of immense benefit to his students. He was forced to disable the classroom community by the Department of Education and Children’s Services in South Australia despite the fact that he used it to teach his students about online safety and received parental permission to carry out his project. The Department of Education is worried that some material on his class blog may put the students at risk of being identified by outsiders. Al and I never met and we never corresponded, but I've been following his work for years and have always found it innovative and inspiring. In my opinion, Al is an embedded practitioner, someone who listens, observes, and is constantly searching for and researching new ways to improve himself and bring greater educational value to his classroom practice. I hope that he will soon regain his freedom to bring the world into his classroom and the classroom out into the world. Freire, P. (1998). Pedagogy of freedom. Ethics, democracy, and civic courage. Rowman & Littlefield, New York. Ever since I returned from EduCon, I've been thinking about instructional conversations. After touring the Science Leadership Academy and listening to SLA students share their views during all sessions that I attended at EduCon, I have come to believe that I need to have more conversations between myself and my students, as well as among all the students in the classroom and the class blogosphere. I think we need more blogtalk - more talk about texts. It's not enough to know how to grow a blog, to pick a topic and keep contributing to one's blog. Our students must also be aware of the class communities in which they learn. They have to have opportunities to think and respond to other writers. They need opportunities to engage in and sustain conversations about their own work and the work of their peers. Blogging is not about choosing a topic and writing responses for the rest of the term. It is about meaningful, thoughtful engagement with ideas. But a grade eight student may need additional support to learn what it means to be thoughtfully engaged. 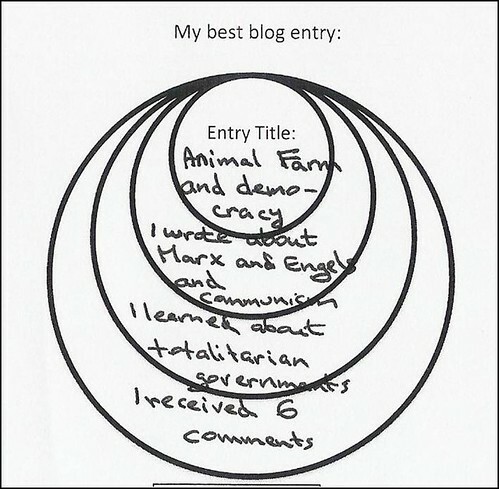 I find that for so many of my students blogging often becomes a race to publish, to write entries and receive comments. (Most of them measure the success of their blog by the number of comments they receive, and the content of the comment is often not as important as the mere fact that it is there). They rarely look critically at their own writing, preferring instead to judge their own work by the traffic that it attracts to their blog. In my opinion, this feature encourages instructional conversations. Comments are not just an extrinsic part of having a blog - in 21classes they are presented as an integral part of the activity. The caption at the top says "Follow Your Threads" thus making it seem like there's a discussion forum attached to every blog entry. All of the links shown in the screenshot above are linked to specific entries where the comments have been posted so the students can easily follow all the comments left by their teacher. They don't have to check every single entry. All they need to do is log into their dashboard and the latest comments and the entries they are attached to will be displayed for them. This does not mean that teacher comments are more important than those posted by the student's classmates. In fact, my doctoral research suggests that peer comments can have a stronger impact on confidence, engagement, and development of writing skills than comments left by the teacher. However, having the peer and teacher comments arranged side by side does help, I believe, in learning to see every entry as an originator of activity that can then lead to deep reflection. The students quickly learn that the same entry can generate very different responses or responses that address the same aspects of the entry but from two different points of view. For example, with the peer and student comments arranged side by side, the students see that my comment on their blossoming personal voice mirrors an entry left by a classmate who wrote that the entry was interesting and fun to read. The two comments, one left by a classmate and the other by the teacher, are indeed quite different but focus on essentially the same aspect of the entry. Seen side by side, they complement and reinforce each other. The voice of the teacher and the voice of a classmate combine to have a strong impact on the author's sense of confidence and can lead to ongoing conversations about his or her work. Also, while I do try to assume a readerly and conversational voice when leaving comments, I also believe that my role in the classroom is to guide and support, and that the students need that specific type of teacher presence to be available to them. Having teacher comments appear in a different column makes instructional conversations easier for the students to follow and participate in. In order to engage in truly reflective thought about their work, students must also have opportunities to analyze who they are as bloggers and writers. They must have opportunities to look critically at their own work and see how they fit into the class blogosphere. Recently, I developed a handout that helps students accomplish just that. This handout gives students an opportunity to pick their single best blog entry and comment on how writing that entry contributed to their growth as a thinker or writer. In other words, I want them to think about the perceived ripple effect that this one specific entry - one specific topic and their subsequent engagement with that topic - had on them as individuals. How did it expand their understanding of the topic? What exactly did they learn? Was there a reaction from the class blogosphere? As you can see, this handout provides a perfect opportunity to start a conversation with a student about his or her specific entry. It's a great opportunity to not only help the student reflect on what she has learned through her entry but also try to discuss the impact of the entry on other writers in the class blogosphere. 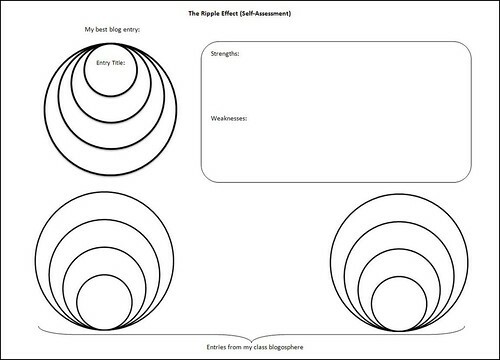 For example, the six comments that Terry mentions in the Ripple Effect diagram shown above offers a good opportunity to discuss specific characteristics that made the entry appealing to his classmates - to discuss, in other words, the impact that his work had on its readers in the class blogosphere. Once Terry completed his Ripple Effect sheet, we sat down and looked closely at the six comments that his classmates left on his blog. We talked about how the depth of his work and his unique conversational style appealed to his classmates. Needless to say, it was a very empowering conversation for Terry but also one that helped him look discerningly at his work and see himself, for the very first time, as a member of a larger community of thinkers, not just a classroom where students write because they need to submit assigned work. Take a look at the first comment under "Weaknesses." Terry wrote: "Careless mistakes that everyone noticed." I did not have to point out to him that his entry was filled with careless mistakes - the community of his peers did that for me. They assumed not only their readerly roles but also the role of the editor. When we sat down with Terry to talk about his work, I did not have to begin the conversation by assuming my traditional teacherly voice and pointing out typos and grammatical mistakes. Having reflected on both his own entry and the comments left by his peers, Terry himself arrived at the conclusion that careful proofreading would make his work clearer and easier to follow for his classmates. This is a very important realization for a thirteen-year-old student. It's a realization that I could have tried to drill into his head by printing and then underlining or circling all the careless mistakes that he had made in his entry. I did not do that. But I did not abdicate my role as a teacher either. I merely adapted my presence to work within a class community of writers. In other words, I chose not to say anything. I chose not to directly address Terry's carelessness because I knew that the community I had helped create would step in and make Terry aware of this problem. Now, let's face it, there are schools out there where modifying my presence in this manner would lead some people to accuse me of being irresponsible, of not doing my job. I believe, however, that creating a community of reflection and support that the student can depend on for timely and accurate feedback that can replace, or at least complement, the role of the teacher is more important and more effective than maintaining my authoritarian voice of the expert. The fact that Terry's realization about careless mistakes did not come from me is immensely important. Learning from his own classmates that his work, while interesting and fun to read, would become even stronger if Terry took the time to proofread and revise is much more effective as a learning tool than constant reminders from the teacher. By encouraging reflection, the Ripple Effect handout helped empower Terry and made him more aware of the strengths and weaknesses of his own work. It also provided me with an opportunity to become a conversation partner, a guide who helped Terry find the time to reflect, to evaluate, to listen to and become aware of his own voice and other writerly voices in the class blogosphere. This awareness of other writerly voices is very important. That's why the Ripple Effect sheet provides an opportunity to reflect not only on one's own work but also on the work of other writers and their impact on the class blogosphere. Once the students get in the habit of looking critically at their own work, I also ask that they look around the class blogosphere and pick one or two entries that had impacted them in some way. Once again, I ask for a reflective response. I ask the students to describe the ripple effect that the entry or entries had on them as individuals. "What did you learn?" I ask. "How did you respond?" "How big of a ripple did this cause in your own understanding of the topic?" "Was there a ripple effect in our community?" "Did people respond? If so, how? ""Did this writer help you grow as a thinker, a writer? Why? How?" The response develops from a simple "Sierra Leone and Child Soldiers by Anna" to a much more complex "I realized what is happening there relates to Animal Farm (undemocratic governments)." The reason why I think this process is valuable pedagogically is because, without it, most of my students would not even be aware of the fact that Anna wrote about child soldiers. The ripple effect handout, however, forces the students to look carefully at specific entries and think about their own reactions. It gives them an opportunity to look carefully at what is happening on other blogs in the class community and then reflect on their own reactions. I want the students to realize that Anna, for example, is not just some isolated writer writing in order to get a grade, but a thoughtful, creative, and sensitive human being who is communicating ideas we can all learn from. Once Terry understands how much Anna can contribute to his understanding of the novel and current international events, he will be less likely to dismiss his class blogosphere as just a group of kids writing for school. 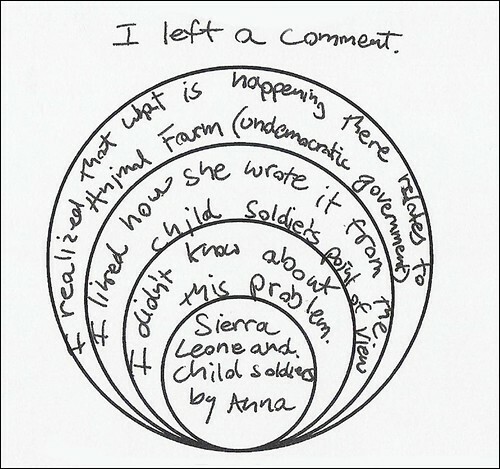 And so, it isn't surprising that Terry's reflection does not end at the last ripple - his engagement with Anna's piece went beyond making the connection between Sierra Leone and Animal Farm - he also made a connection with the author, with Anna herself, and, as his own words indicate, he cemented that connection by leaving a comment. I admit, this approach is still in its infancy, but it provides a valuable mechanism to engage students in reflective thinking about their work and the work of their peers. It also provides an opportunity to continue to redefine my presence in the classroom. The point here is that when we talk about blogging, most of us focus on writing. We tend to ignore the fact that a class blogging community provides teachers with a very valuable opportunity to use informal instructional conversations to engage our students as thinkers and writers. These conversations can help our students immerse themselves in the rich tapestries of voices that characterize blogging communities.